After the black aspect, Neltharion betrayed his fellow dragons and other protectors of Azeroth, Illidan, desperate to curry favor with an elven priestess Tyrande, left the army fighting against the Burning Legion. Full of envy and pride he chose to serve the evil and didn’t know that his beloved Tyrande had been kidnapped by servants of his new master — Sargeras. Willing to get back at Malfurion, who had been fighting so effectively against demons of Twisting Nether, the fallen titan ordered his henchmen satyrs to bring Tyrande to Zin-Azshari and lock her in a cell. Malfurion could not stand it, but for the sake of Azeroth’s rescue, he had to put aside a desperate intention to save Tyrande for a while. He was to destroy Dragon Soul — a dark artifact with the help of which and because of which Neltharion had done so much evil. When Illidan entered the capital of the highborn elves and stabilized the portal, everyone, even Sargeras himself, recognized his genius of a great mage. Always bold and desperate, Illidan promised Sargeras to find Neltharion’s lair and steal Dragon Soul. Sargeras was aware of the artifact’s power: it could easily stabilize the portal and let him finally step on Azeroth’s land. So the offer was accepted when suddenly two fire-like whips broke out from the depths of Eternity Well and sank into a pair of golden eyes. When agony went away, the surrounding world was an endless flow of energy in Illidan’s view. This was a Sargeras’s gift to the elf. Meanwhile, Malfurion plunged into the Emerald Dream. He wanted to find out the location of the black aspect, who had already started calling himself Deathwing. The lair was very deep under ground; even deeper the golden disk rested. When Malfurion returned to his usual state he knew where to go and what was waiting for him: cruel goblins, trolls, and golems protected the path to the furthest cave. The druid had to fight and kill them all. When finally all the enemies were left behind and the golden disk dropped into Malfurion’s hands, a blood stunning scream was heard from another cave nearby. It was Deathwing and he knew that his treasure had been taken. There was no turning back: Malfurion had to fight against the black dragon or escape. Having decided to use the power of the artifact the elf hacked through the thickness of earth and emerged on its surface. But once he ran away from the dragon, Illidan and captain Varo’then seized Malfurion and took away Dragon Soul. They didn’t even have to deal with the dragon — what a good luck! Even though the druid managed to escape his enemies second time in a row, the future of Azeroth and everything living was in dark hands of the evil again. 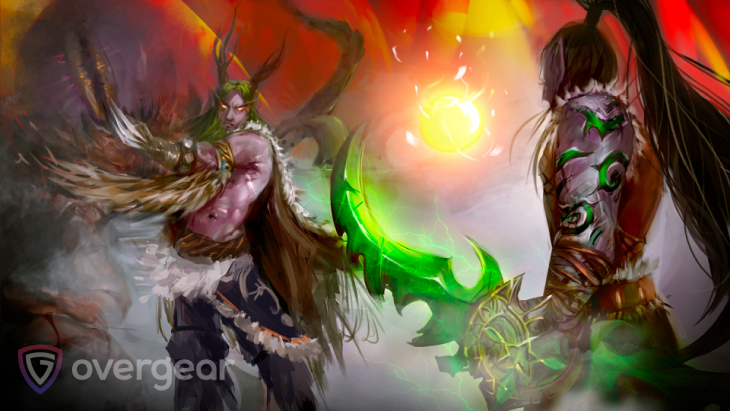 Triumphant, Illidan and Varo’then returned to Zin-Azshari and presented their loot to Sargeras. The fallen titan started fortifying the portal at once. It happened so, that in a blaze of glory, foreseeing possible results of his pride and recklessness, Illidan started doubting whether he had been right to betray his brother and all the night elves fighting and dying for Azeroth. At that very moment, when Illidan was thinking it over and over again and attention of others’ was fully geared to what Sargeras was doing, a highborn elf Dath’remar rescued Tyrande from her cell. He and other highborn dissidents decided to ran away from Zin-Azshari even if they had to fight the demons guarding them. During this battle, a Doomguard seized Tyrande and let her fall from a high altitude. She must have died if not for Illidan who was watching her beloved escape and with one incantation saved her life. Azeroth and all the creatures inhabiting it were still within an inch of dying, but what role would play Illidan in those happenings — yet remained unclear.